Donald Trump’s appearance before the General Assembly of the United Nations could have been a rare highlight of his chaotic young presidency. If Trump had just repeated his inauguration address, the audience would have burst out in gales of laughter. Instead, they countered his bluster not only against North Korea and Iran but also against the UN body as a whole with broad silence. Trump tried to be serious, but instead, he presented himself as the most dangerous President ever in US history. He went after the North Korean regime as the devil himself would run it. The Iranian government followed suit. In the bashing and demonization of other governments, the US has always been top. That America comes “first” and that his administration has been successful were among his nicest bravados. Trump spoke exactly the truth about his nation. “Rogue regimes represented in this body not only support terrorists but threaten other nations and their people with the most destructive weapons known to humanity.” Don’t the US support terrorist regimes such as the Saudi and the Israeli ones, which threatens other nations and peoples with annihilation and spread terrorism in the region and in the Saudi case worldwide? Haven’t the US caused havoc to Afghanistan, Iraq, Libya, Syria, and Yemen? If the North Korean leader is smart, which he is, he should speed up its nuclear program to defend his country and his people’ safety against the “Rocket Man” in Washington. Kim Jong-un doesn’t threaten the US with annihilation; it’s the other way around. Indeed, Trump was right in saying that every nation should “uphold these two core sovereign duties: to respect the interests of their people and the rights of every other sovereign nation.” Sovereignty and independence from the US are what the North Korean and the Iranian governments are pursuing. In this respect, they are all with Trump. 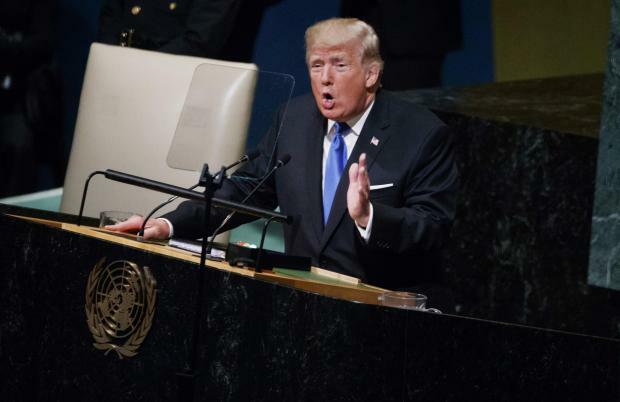 The US President repeatedly stressed sovereignty, while repudiating global government the UN symbolizes and the EU wants so desperately. Trump’s praise of the US constitution and all the US niceties as the outmost mankind could achieve. And “a small group of rogue regimes that violate every principle on which the United Nations is based.” Trump must have forgotten how the Bush/Cheney regime disdained the UN and trampled around the values of this organization. The George W. Bush regime violated every international law. How come that a nation that out of its 241 years of existence was 220 years at war? Why do the US need 900 military basis around the world? Are they for spreading peace and democracy or conquest? Trump used fierce language against North Korea. He castigated the regime that threatens the entire world with its nuclear weapons. In fact, the North Korean leader doesn’t threaten the world with annihilation like Trump did in his speech. The country just wants to be respected and recognized as a nuclear power such as Israel, which is a nuclear power but the major powers don’t waste any words on it. “The United States has high strength and patience, but if it is forced to defend itself or its allies, we will have no choice but to destroy North Korea utterly. Rocket Man is on a suicide mission for himself and his regime. The United States is ready, willing and able, but hopefully, this will not be necessary.” Trump is the one who uses inflammatory language such as “Rocket Man” or “fire and fury” that will rain down on North Korea. Instead of threatening the Kim regime, the US together with Russia, China, Japan and South Korea should embark on diplomacy rather than saber-rattling. The other country, Trump singled out to slander is Iran. The crazy stuff he said about this country was probably written down by Benjamin Netanyahu and his war-hawkish Ziocon friends in the US. Netanyahu has been preaching these irrational things since the 1990s. What Trump unfolded before the audience was a cartoon and had little to do with Iran’s reality. Trump called Iran a “rogue state and a murderous regime” that uses its wealth and resources “to fund Hezbollah and other terrorists that kill innocent Muslims and attack their peaceful Arab and Israeli neighbors.” As Trump sees it, Iran apparently “shores up Bashar al-Assad’s dictatorship, fuel Yemen’s civil war, and undermine peace throughout the entire Middle East.” Hasn’t President Obama together with the Saudi dictatorship and some other Arab states financed and trained the terrorist organizations in Syria to topple Assad? Doesn’t the Trump regime support the genocide Saudi Arabia is committing in Yemen by providing weaponry and other logistical support? What about the terror inflicted upon the Palestinian people by the Israeli occupation regime? “The Iran Deal was one of the worst and most one-sided transactions the United States has ever entered into. Frankly, that deal is an embarrassment to the United States, and I don’t think you’ve heard the last of it – believe me.” What Netanyahu didn’t get from Obama, President Trump will deliver. To start a war against Iran for the sake of an occupying power and a racist regime is irresponsible. Trump seems to sacrifice American soldiers for the oppressive Zionist regime. Trump also went after what he sees as “radical Islamic terrorism.” The embodiment is supposed to be Iran. But the largest supporter of worldwide “radical Islamic terrorism” is Saudi Arabia, Qatar and other rogue states in the region. In contrast, Iran is fighting together with Russia and the Syrian government this Sunni brand of terrorism, which the US created through its wars against Muslim countries in the first place. Trump’s bluster on North Korea seems not the greatest problem but Iran. What he insinuated was regime change, for which the Zionist regime has long been calling. Trump and his UN ambassador Nikki Haley have been undermining the nuclear deal with Iran, although the International Atomic Energy Agency (IAEA) in Vienna has been testifying that Iran is meticulously complying with every jota of the agreement. The IAEA publishes the next report mid-October. If Trump decides, or Netanyahu tells him, to walk off the deal, the reputation of the US as a reliable contracting party is gone. The word of the US government wouldn’t be worth a damn. The “Axis of Evil”, the US, Saudi Arabia, and Israel, are working together to undermine or even attack Iran. For them, the so-called Iranian nuclear threat is more imminent because Israel wants total hegemony over the Middle East. Iran is the last obstacle on their way to dominance. That Israel with its fast nuclear arsenal is the real threat for the region is ignored. It’s government refuse any inspections of its nuclear facilities. Trump avoided the elephant in the room, instead he demonized Iran who is a stabilizing force in the region unlike Israel.